Want to learn about the daVinci Award Program? ​Since its inception in 2001, the daVinci Award program has become a prestigious international forum of recognition for the most innovative developments and research in adaptive and assistive technology. The awards celebrate people who triumph over disabilities and those who have developed new technologies and innovations that enhance mobility and enable all people to function at their fullest. GripMate Products, Inc. was pleased to have been nominated for this award in 2013. For more information on the daVinci Award program, see the link on page four of this website. Proceeds from this program benefit the National MS Society and supports their mission to create a world free of Multiple Sclerosis (MS). Here's a great new resource to benefit people with a variety of disabilities. Adaptive Sports Equipment, Inc. is a multli-athletic discipline supplier of adaptive sports and recreation equipment. 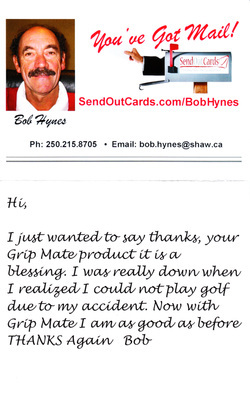 This is a thank-you card from a long-time GripMate user in Canada (an impressive 5"x7" full color glossy card). He said we could reproduce it with his picture and name. He has a business that is a perfect way for people to say thank you to all their clients, friends and family. He says: "Send Out Cards is the easiest way to send a card to someone you know or someone new. It takes only minutes to design, add a photo or just write something. When you hit send from your computer we take over, we make the card, put it in the envelope, add the proper stamp and away it goes. We use recycled paper and good quality cards. To get all the details go to www.sendoutcards.com/bobhynes and send a free card to someone." Golf Online - Watch Live Golf Online including all major PGA tours, LPGA tour, and European tour.